Busy families love chest freezers. They offer plenty of storage space, without having to spend ages arranging items in drawers to make them fit. The CF374W is a 4 star rated model which is energy efficient too. If you need room for storing in bulk, the CF374W is perfect. It has 104 litres of usable space, making it an ideal solution for big households. Reduce those shopping trips and stock up on bargain items while they’re on sale. 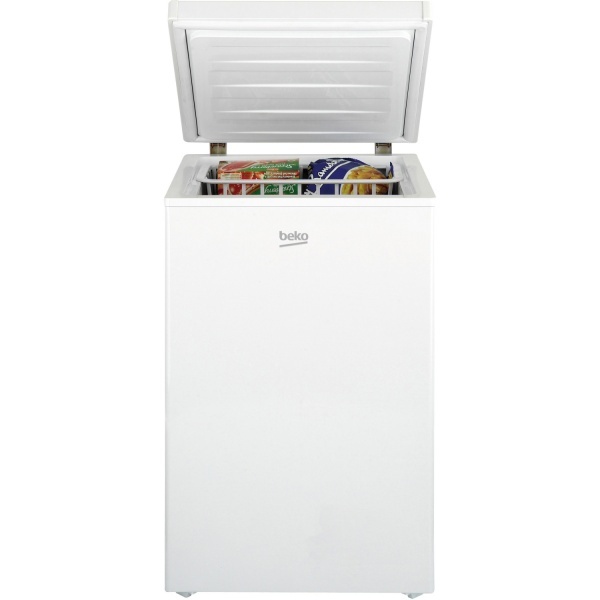 A chest freezer like this also gives you more flexibility with family meals. Its top 4 star ratingmeans you can freeze those leftovers from fresh, and store items for up to a year. With maximised internal space, the footprint this model leaves is minimal. It’s just 86 cm high, 54 cm wide and 61 cm deep – not much more than the average under counter freezer. There’s even a storage basket for those small or regularly required items. No more digging around to find that tray of ice cubes. With an A+ energy rating, there’s no need to worry about your electricity bills. The CF374W costs around £23 a year to run – less than many other models in its category. The CF374W has a quality design, with a counter balanced lid and sturdy metal hinges. This means you can remove items without worrying about the lid falling on you. Freezer guard technology protects this model in a wide range of temperatures. It’ll work anywhere in the home, even if temperatures outside drop as low as -15oC. The high temperature warning light is invaluable after a power cut. This gives you peace of mind that the interior hasn’t got too warm.